Rarity and Value: This is the most common denomination that you see on these early bank notes. However, don’t assume that they are all inexpensive. Usually even the most generic examples should be worth around $1,000. Based on the bank rarity and condition, the value could be many times that. We would always advise contacting us if you need an exact value. Don’t forget to check the serial number. Number 1 notes always sell for nice premiums. Current Market Analysis: Most people collect national bank notes based on which city the bank was in. The market is a little bit different for notes from Massachusetts. Very few towns in Massachusetts are technically rare. However, some types are plenty rare. For example, it may be very easy to find a red seal or blue seal from a bank, but brown backs and first charters could be rare. We should also mention that notes from Boston are typically discounted a little bit compared to other towns. Sadly, notes from Boston are viewed as common and not as desirable, even if they are rare for the bank. Oddly though, notes from towns that are in the Boston metro area actually have a relatively close following. 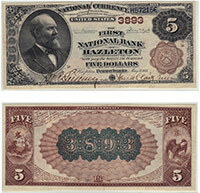 We buy all antique paper money issued by The First National Bank of Easthampton, MA. We can tell you how much your $5 bill is worth. We aren’t just dealers. We are also collectors, experts, and appraisers. We have contributed to numerous price guides and are considered specialists in the field of national currency. Contact us via phone or email to get your free appraisal today.